Sunday, December 29 1907 -- The year comes to a close, marking George Herriman's first full calendar year at the LA Examiner. 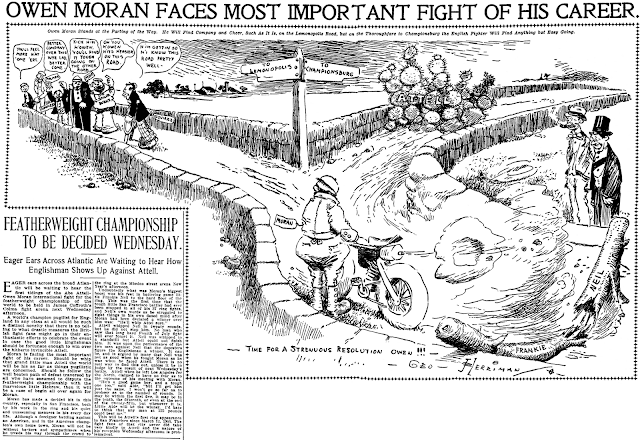 The top cartoon, a full page width dilly that ably marks the occasion, is about the upcoming featherweight championship bout between Abe Attell and challenger Owen Moran, but I need not tell you more since for once I was able to preserve the complete news story as part of the image. 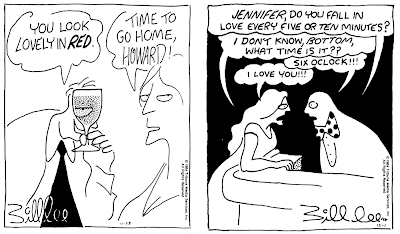 The second cartoon commemorates the Jonathan Club's annual Jonathan Jinks revels, which apparently featured quite a bit of cross-dressing by L.A.'s rich set. Dale Goss' Tom Trick activity feature is outside the official purview of Stripper's Guide (we don't do activity and puzzle features), but when has that ever stopped me from doing a post, especially when all the materials are handed to me ready to go? Alex Jay submits these images from the Seattle Times, chronicling the start of syndication of local artist Dale Goss' Tom Trick feature. Thanks Alex! Tom Trick: That's what "Brick Bradford" was called in Sweden! Well, it's been a long while since we covered one of the New York Herald-Tribune's filler strips, so let's rectify that. 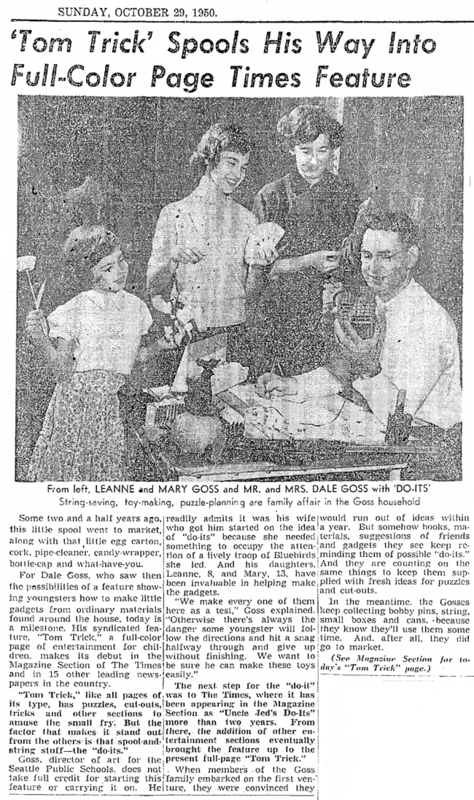 As regular readers of the blog know, during most of the 40s and 50s, the H-T ran a series of sixth-page strips as fillers when the page layout required. Usually this happened when they ran a page with a half-page strip and a third-page ad. The extra space would be taken by a one-tier filler. Most of these 'filler' strips are eminently forgettable, with some notable exceptions. 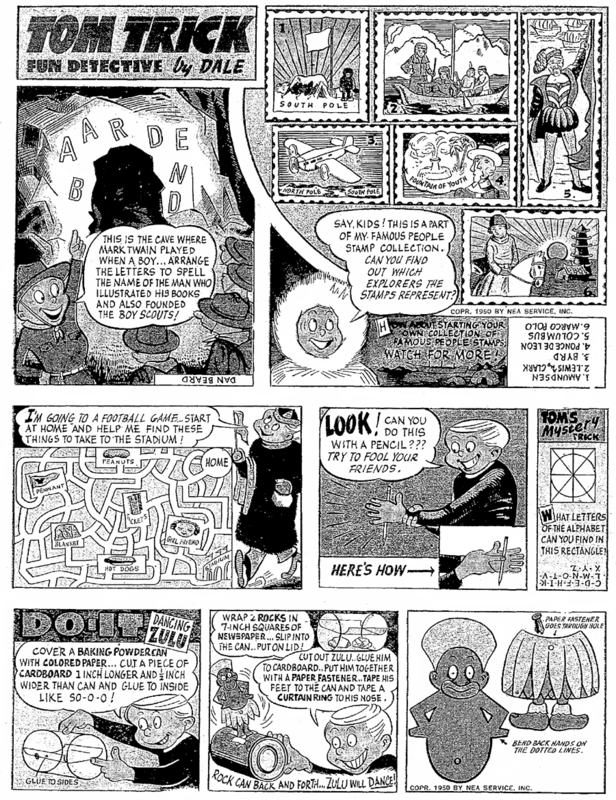 The great Harvey Kurtzman's Silver Linings, for example. Skimpy, on the other hand, well, let's just say I'm not expecting Fantagraphics or IDW to issue a reprint volume anytime soon. It was, however, one of the more frequently used filler strips in the H-T, so someone thought well of it. 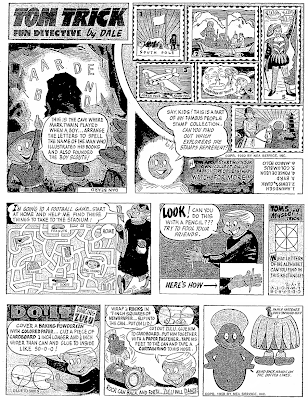 Joe Calcagno's filler strip ran as needed in the Sunday comics section of the H-T from March 7 1948 to November 12 1950. Hello, Allan----Knowing the litigious aspects of Percy Crosby, I'm surprised the Herald Tribune got away with this one. So all that's left for my comment is about the short and unsuccessful U.S. run. General Features, a perennially anemic second-string syndicate, took on the U.S. distribution of the strip a couple years after it began on the other side of the Atlantic, starting here September 10 1951. Why GFC thought Flook would go over in the States I can't imagine -- the strip is so rooted in British sensibilities, slang and culture that most Americans would need annotations to fully appreciate it. GFC gave it their best shot, though, offering it for almost three full years to a whole country full of indifferent newspaper editors. The U.S. run ended on June 26 1954 when GFC finally pulled the plug and filled Flook's slot in their line-up with a very American two-fisted, take no prisoners reporter strip, Jeff Cobb. Hello, Allan---I'll bet that Flook wasn't seeing a mirage of New York in it's original context. The chap with the pipe and the double-deck bus don't elicit the gothasm I'm acquianted with. Isn't that fancy structure seen in the first two episodes the memorial to Prince Albert?-------Cole Johnson. I'm one of those shlubs who would need the annotations, but, yeah, I imagine in the original the mirage was Swingin' London. Gothasm = the excitement a visitor feels when first arriving in NYC? Make a great marketing gimmick I think, replace "I (heart) NY" with "Visit NY, Have a Gothasm!". I'm torn between roiling in the warm rays of brilliant lexicographic initiative here, or just admitting my old eyes aren't as good as they used to be. ----Cole Johnsasm. Oh wow great to see this again! This used to run in the Daily Mail (right-wing biased British tabloid newspaper) I believe. Criminally under-recognized, thanks for posting! Oh and are you the same Cole Johnson who had stuff in Kramers Ergot and the second Yale anthology? Here's another few short articles from Editor & Publisher, each of which discusses a feature I've so far been unable to locate. Have you seen any of them? 4/13/29 - Bell Syndicate, Inc. has started a new daily continuity strip, called "Tark." It is drawn by Aslan Bey and the continuity is written by J. Kenneth Jovey. The central character is a detective. 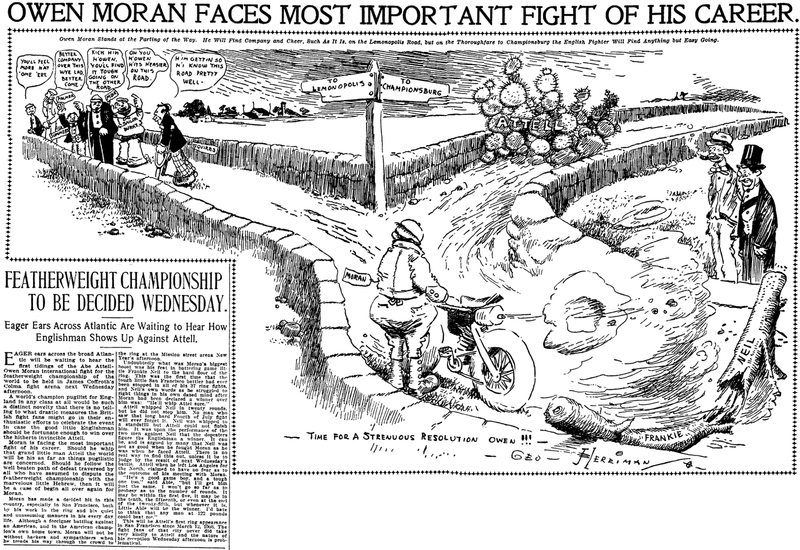 3/22/30 - A local cartoon strip, done by Dennis McCarthy, has been added to the San Francisco News. Each day, McCarthy interviews some prominent San Franciscan and tells the story in a picture strip. A Google search located a book, "Scripps-Howard News: Volumes 3-4", which was published in 1929, according to the search information. Searching within the book, the year 1929 is mentioned 21 times, and 1930 is mentioned 11 times. Examining the snippets of text involving 1930 show that the events were from the past. So the book contains material published in 1929 and 1930.
is doing for the News. The feature did exist but only in the San Francisco News. Can't let Alex have all the fun. Fred Eisenzoph (Frederick Michael Eisenzoph) was born in MIchigan November 22, 1905. 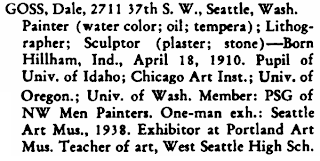 He seems to have spent his adult life in Chicago where he died on October 14, 1969. 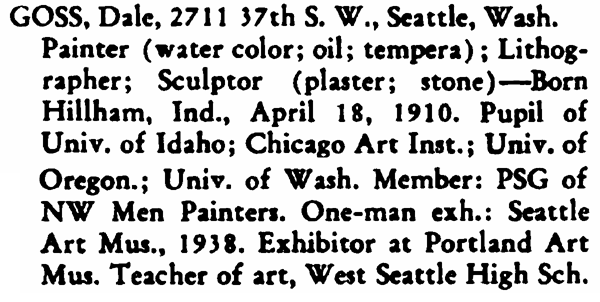 In the 1930 Chicago census he lists his occupation as commercial artist. The puts him just a hundred miles north of the Hopkins Syndicate homen=base of Mellott, Indiana. Couldn't find a Pictur-Grams sample though. I don't doubt that there was such a feature, but it can't be ticked off the mystery list until I see samples. SF News has been added to my research list for the next Library of Congress trip (that list is getting loooooong) but thought I'd throw it out there just in case someone's holding a sample. A Google search found an Eisenzoph cartoon, "The Cartoonist looks in on a 'quota setting' ", in the April 1928 issue of The Magazine of Business. Eisenzoph drew cartoons for the book, Behave Yourself, which was published by J.B Lippincott in the mid-1930s. He married Mildred V. Birch in Chicago on August 5, 1933. Services for Fred Eisenzoph, 63, of 4926 N. Mozart st., will be held at 11 a. m. today in the chapel at 5303 N. Western av, Mr. Eisenzoph, who was art director for Science and Mechanics magazine for 25 years before entering semi-retirement five years ago, died Tuesday in Edgewater hospital. He had been hospitalized since he fell in his home three months ago. Mr. Eisenzoph worked part-time as a commercial artist for Opportunity magazine and a syndicated columnist after he left Science and Mechanics and before he retired two years ago. Survivors include his widow, Mildred; two daughters, Mrs. Johanna Benson and Mrs. Gail Bush; a brother; and two grandchildren. Cartoonist Bill Lee was one of the crop of excellent new gag cartoonists to come out of the 1970s, a time when cartoons about battling spouses and family pets were giving way to more esoteric, avant-garde material. Lee honed his skills in underground comics, then at magazines like Penthouse, Omni and National Lampoon. His signature style, which looks like a handful of bits of string tossed casually on a drawing board, is instantly recognizeable. Over the years Lee tried his hand repeatedly at newspaper syndication with the Chicago Tribune-New York Daily News Syndicate, never with much success. His outre cartoons just didn't seem to be what newspaper readers wanted with their morning coffee, or rather what newspaper editors think they wanted. 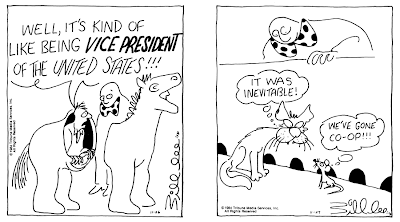 Frankly Lee's syndicated work is not nearly up to the level of his magazine cartoons anyway. Either the pressures of a daily deadline were too much for Lee, or he tried to dumb down his gags to appeal to the masses. Whichever was the case, his newspaper work tends to be sorta meh with occasional flashes of the Lee brilliance. Bottom's, his second feature for CTNYNS, was a daily panel set loosely, very loosely, in a restaurant. The sketchily defined cast includes the bartender, a fellow named Bottom who sports a clownish bow tie, waitress-actress Jenny and Ralph the cat. Although the gags are often set in the restaurant, Lee has no problem with abandoning this locale in search of gags. The humor is sometimes bizarre in the best Bill Lee tradition (a school of sharks 'swim' in the floor of the restaurant in one gag), sometimes political (a headless man runs for vice-president), and on off days disappointingly conventional (see "Nice Serve" above). The panel ran from 1984-85 but I don't have anything like definite start and end dates for this rarely seen feature. The syndicate advertising folder for the feature begins with the week of October 15 1984, but I suspect that might not be the first week, perhaps by a couple months. I have no idea how far the feature got into 1985. Another Chicago Tribune feature that didn't run in the home paper. These are really witty and I look forward to my weekly Ivey fix.